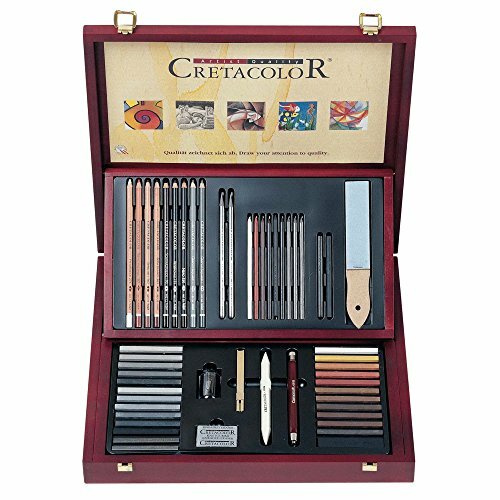 The Selection Wood Set by Cretacolor comes in a beautiful two tiered Mahogany wood box and is designed for the professional artist. Included in this 53 piece set is a comprehensive range of the highest quality drawing materials perfect for the demanding artist. The contents encompass solid sticks of graphite, richly pigmented pastel pencils, smooth and uniform compressed charcoal and charcoal pencils as well as Sepia and Sanguine. The set also contains a lead holder, pencil sharpener, rubber eraser and blending stick. Made in Austria. If you have any questions about this product by Cretacolor, contact us by completing and submitting the form below. If you are looking for a specif part number, please include it with your message.